In the early 60’s, Pacific Basin Trading Company (PABATCO), a subsidiary of Farm Chemicals located in Athena, Oregon was looking to export its products outside of the U.S. At the same time, Yamaguchi Motorcycles was looking to follow on the success of Honda and begin importing motorcycles into the U.S. market. The two companies formed a partnership and began selling the 49cc and 80cc Yamaguchi Motorcycles in 1961. According to an article by Peter Star, “by 1963, Pabatco had imported 5000 machines and distributed them through its 480 dealers.” But, in 1963 the small Yamaguchi Company went bankrupt— leaving PABATCO looking for another manufacturer to partner with for the profitable motorcycle division of the company. Hodaka Industrial Company, maker of the engine for the Yamaguchi, was still in business. A few PABATCO employees got together at the local bar to discuss a design for a motorcycle around the Hodaka engine. According to Motorcycle Classic, styling cues for the planned bike were taken from the Cotton, a British made off-road competition machine with a record of success in off-road racing. In 1964 the new dirt-bike designed by PABATCO employees and built in the Hodaka factory, known as the Ace 90, was released to the U.S. market. The small motorcycle only cost $379 dollars and was street legal. The Ace 90 was a little dirt-bike that helped propel the sport of dirt-bike riding and racing. The Ace 90 came in one color: red with silver. They also designed the bike with the intent of no model changes from year to year, so that most parts would remain interchangeable. The light-weight Hodaka Motorcycles were perfect for off road racing. At the time, there were no major competitors from Japanese or U.S. companies. British companies like B.S.A. offered off road motorcycles, but nothing as light and easy to maintain as the Hodaka. In 1965, Shell Chemical purchased Farm Chemicals and suddenly found themselves owners of a small motorcycle company. With the motorcycle making a profit, they saw no reason to make any changes. And so, throughout the late 60’s and 70’s the Hodaka racked up race wins across the country, including the California trail bike championship in 1966, ‘67, and ‘68. 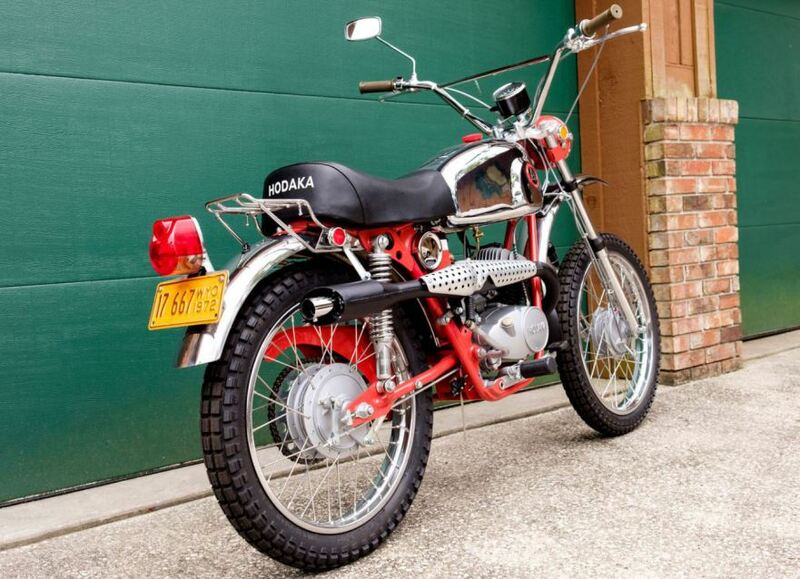 In the late 60’s and into the 70’s, Hodaka continued making minor upgrades and changes to the motorcycle and released other models such as the Super Rat, a motocross version of the Ace 100. By the mid 1970’s companies like Honda and Yamaha were beginning to pay more attention to the off-road market and started to release motorcycles that competed directly with Hodaka. Sales began to fall, but the company was still profitable and still releasing new, larger models such as the Road Toad. The primary contribution to the demise of Hodaka turned out to be the economy. The exchange rate between the U.S. Dollar and the yen increased the cost of Japanese goods in the U.S. market. In the late 1970’s, Shell noticed the company was no longer making a profit and Hodaka eventually went bankrupt and shut down production in 1980. Shell did try to purchase the Hodaka engine plant in an attempt to reduce cost, but they would not sell. Shell decided not to renew the contract and the business was shut down. With multiple chat rooms, owners clubs, rallies, and internet sites dedicated to the Hodaka, the brand has managed to live on through those who love it. Each year at Hodaka Days in Athena, Oregon hundreds get together to share bikes, have a parade, and meet a few of the people who were involved in the manufacture of the motorcycle. It was never claimed that Hodaka made the best dirt bike at the time, though it might be argued that they did. Still, they have always been considered fun and collectible. Even today, when a Hodoka shows up at a motorcycle show, people usually have to take a quick look and snap a picture of the nostalgia-grabbing beauties.